SAN FRANCISCO, CA--(Marketwire - October 12, 2010) - WaterField Designs, a San Francisco manufacturer of custom laptop sleeves, bags and cases for digital gear, introduces the iPad Wallet -- a lightweight, sophisticated iPad case for the iPad, the Apple Wireless Keyboard and accompanying accessories. The case allows digital professionals to carry and protect a complete mobile office in one compact, stylish case, either under the arm, in another bag or -- with the optional shoulder strap -- as a stand-alone bag. "Most iPad users prefer using the Apple wireless keyboard in conjunction with the iPad to type more easily and efficiently," explained WaterField Designs owner Gary Waterfield. "With an iPad, the Apple Wireless keyboard, an adapter, and necessities like keys and a few credit cards -- all safely stowed in the WaterField Designs iPad Wallet -- you have everything you need for a day's work or play protected and at your side." More than a simple case, yet smaller than a messenger bag, the highly compact iPad Wallet celebrates the ultra-portability of the iPad and wireless keyboard. Scratch-free pockets, foam lining, and impact-resistant plastic inserts separate the two devices, and a soft, scratch-free internal pocket plus a stretchy outside back pocket stow cables, cell phone and other small necessities. Available in a choice of six panel colors, each iPad Wallet travel case is flanked by eco-friendly, distressed leather trim. YKK self-locking zippers seal the deal for this rugged case. Optional D-rings and a strap convert the innovative iPad case into a svelte, stand-alone bag. The versatile iPad Wallet can accommodate the iPad within another case, including WaterField's Ultimate or EXO SleeveCase, Smart or Slip Case, or Suede Jacket. The iPad Wallet is the newest of WaterField Designs' iPad cases, joining the above-mentioned and the Muzetto, a bespoke, leather iPad messenger-style bag. 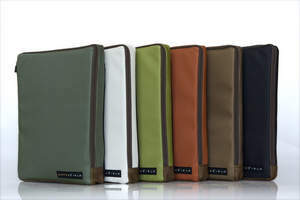 iPad Wallet Price: $79 Colors: Black, Copper, Pine, Green, Flame and Pearl -- each with brown distressed leather trim. Optional -- D-rings: $5, Simple Shoulder Strap: $9. Suspension Shoulder Strap: $19. Dimensions: 11.5 x 9.3 x 1.5 inches. Weight: 15 oz. Pre-order the iPad Wallet at http://www.sfbags.com. Shipping begins October 31, 2010. All WaterField Designs products are Made in USA. WaterField Designs manufactures custom-fitted, high-quality cases and bags for a full-range of laptop computers, cameras, and other digital gear. All products are manufactured to exacting standards in San Francisco. More information available at http://www.sfbags.com/aboutus.php. WaterField Designs, iPad Wallet, Ultimate SleeveCase, EXO SleeveCase, Smart Case, Slip Case, Suede Jacket, Muzetto, are trademarks of WaterField Designs. Other company/product names may be trademarks of their respective owners. Gary Waterfield, owner of WaterField Designs, demonstrates the protective iPad Wallet. The iPad Wallet holds and protects both the Apple iPad and the Apple wireless keyboard in one compact, high-quality, iPad case.